So you need to design a postcard that will create interest in your school's job training program. Well, if you're like most. You fill it with lots of pictures of smiling students and colorful campuses. On the other hand, you could stand out from the pack and create a design that is serious and professional. 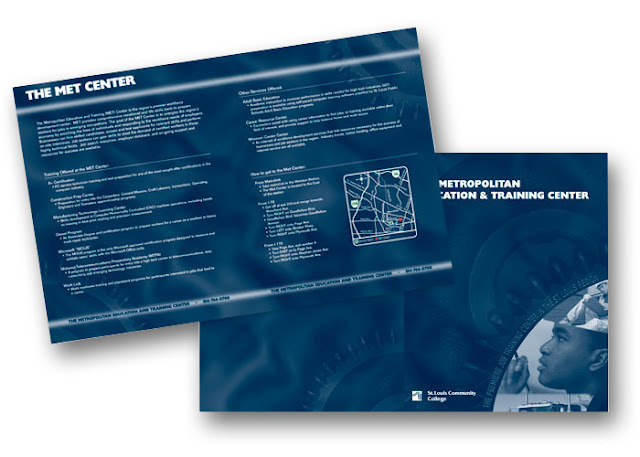 Designer Tim Scheman uses a monochrome blue palette, lots of bullet points and thoughtful graphics for recruiting students to the Met Center at St Louis Community College. I think the postcard design works because those who are interested in job training programs are likely to be serious themselves -- not looking for glitz and frills. The no-nonsense design conveys a "we're here to learn" message.